Which brings me to why I sought out Codecademy in the first place (thanks to @m_wall for the twitter-solicited tip-off) – I am preparing to teach Psychology undergrads how to code. From 2012/2013 onwards, my academic life is going to be a little more ‘balanced’. As well as the research, admin and small-group teaching I currently enjoy, I’m also going to be doing some large-group teaching. Although I have plenty to say to undergraduates on cognitive neuroscience and cognitive psychology, I think giving them some coding skills will actually be much more useful to most. As my experience with Codecademy has recently reinforced to me, coding basics are the fundamental building-blocks of programming in any language. They will hold you in good stead whatever dialect you end up speaking to your computer in. What’s more, they will hold you in good stead whatever you end up doing, as long as it involves a computer: coding is the most versatile of transferable skills to be imparting to psychology graduates who (rightly) believe they are leaving university with the most versatile of degrees. 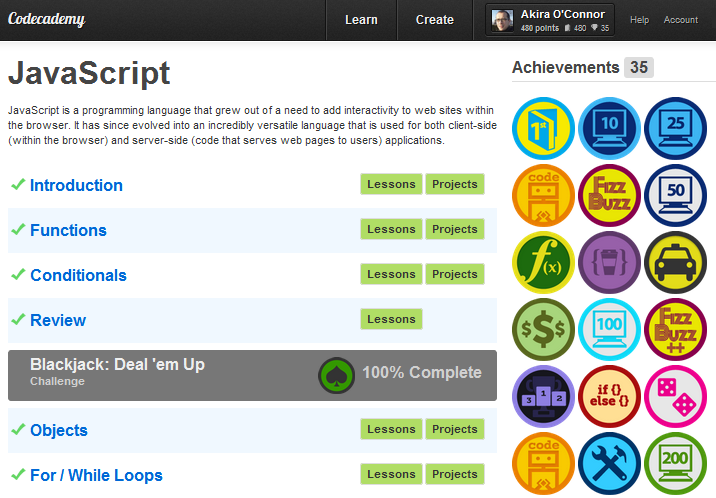 Glad to hear people using codeacademy. I’ve also seen this site come up for self-taught coding: http://teamtreehouse.com/library. – passive vs active learning. Teamtreehouse (passive) uses well-edited videos to teach the fundamentals of coding, but requires you to have the discipline to practice yourself. Codeacademy (active) uses an IDE-like interface that sets you coding tasks you have to achieve in order to progress to the next stage. Codeacademy works better for me, though I can see teamtreehouse being useful if there is a major topic area (with a well-indexed video) I would like a refresher on without necessarily jumping through all the badge-geared hoops. By the way, I think it’s a great idea for undergraduate to learn how to code. I can’t think of a discipline whose graduates wouldn’t benefit from having coding on their CV. If you’re looking to dive into css and html, you may enjoy diving into creating a child template for wordpress. I’d be more than happy to help with the process. I may take your offer up on this! Having done most of my html learning from a For Dummies book back in the late 90s, I’m currently a little out of touch. (My attempts at learning CSS in the mid-00s were thwarted by my desire to not be the webmaster – remember that word?! – for the Leeds University Film Society anymore). Cool. Then you’d get to learn some php and wordpress api. It’s fun stuff. I’ll even make a badge.